Experience the coastal vibe in this quintessential Leucadia home just blocks from world class beaches! This stunning 4 bed/3 bath home offers lush tropical views from every window. Loaded with charm & character, this home boasts original hardwood floors, renovated state-of-the art kitchen, three fireplaces, & custom tile work throughout. 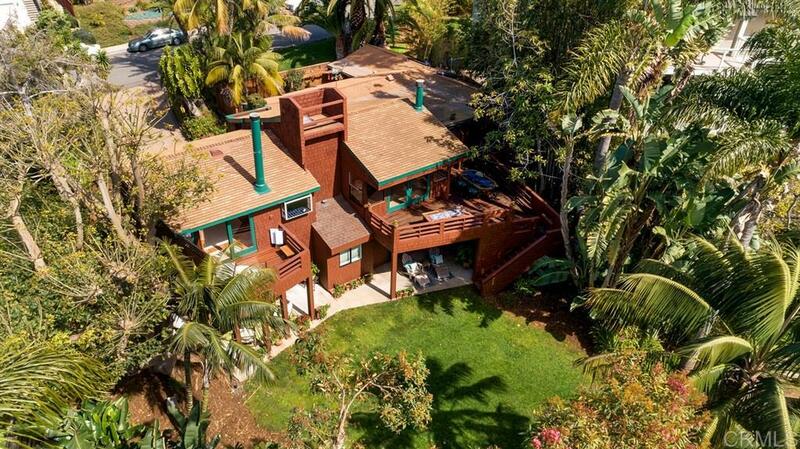 Situated on .24 acre lot with private courtyard, huge backyard with mature lush landscaping, expansive decks, covered patios, large grass area, spa, & outdoor shower., Experience the coastal vibe in this quintessential Leucadia home just blocks from world class beaches and nestled in the heart of Encinitas. This stunning 4 bedroom, 3 bath, home features lush tropical backyard views from every window. Loaded with charm and character this home has the original hardwood floors, beautiful woodwork throughout, and custom tile-work. The renovated kitchen boasts stainless appliances, granite countertops, wine fridge, rich cabinetry, large pantry, and expansive eat island. Filled with natural sunlight this home offers open concept floor plan that includes a large living room with custom fireplace and french doors to deck with lush tropical views, an expansive family room with cozy fireplace and custom seating that flows seamlessly off the kitchen, and quiet courtyard with water feature. The luxurious master suite offers vaulted ceiling, cozy fireplace, and private deck with hot tub. Other features include; brand new carpet, an additional bedroom with french doors leading to the generous deck on the main floor. Downstairs is a a bonus room/ bedroom with full bath, private entrance, and french doors that lead to covered patio, perfect for a studio or home office. Nestled on .24 acres, this backyard features mature tropical landscape, spacious grass yard, outdoor shower, custom playhouse and covered patios to enjoy incredible backyard views. Don't miss the ocean views from the roof top perch!